An example of shakōki dogū. The shakōki dogū are Japanese figurines dating back to the Jōmon era. Dogū are made of clay and range from 3 cm to 40 cm tall. The word dogū refers to any humanoid clay figure. They were created in the Jōmon period, which spanned from approximately 11,000 to 400 B.C. There are multiple types of dogū, but pseudoarchaeological beliefs center around the shakōki dogū, or "goggle eye" type. The types of dogū found at a site depend on the time period in which the site was inhabited and the geographic location of the site. The shakōki dogū type are characterized by narrow waists, wide hips and breasts, large stylized eyes, inflated legs and arms, and ornate clothing and facial decorations. Shakōki dogū were only produced in the final period of the Jōmon era, from approximately 1,000 to 300 B.C. They are most commonly recovered from multipurpose sites with storage, dwellings, and burials, and most of the figures are found discarded in refuse. Many figures feature exaggerated hips and breasts, sometimes with swollen abdomens. For this reason, researchers believe that they are made to represent female forms and fertility, but religion in the Jōmon era was likely highly variable between regions and time periods, so it has also been suggested that interpreting all dogū in the context of fertility may be imprudent. It is also thought that the dogū were not made to represent actual people, but rather mythological constructs. Even so, the later and more elaborate figures demonstrate adornments that would likely have been common and present in Jōmon culture. The figurines do not always have human facial features, which seems to support the idea that they were not made to be representations of specific individuals. Other dogū have faces in the shapes of hearts, faces with projections, or otherwise not entirely human in nature. Therefore, a precedent is established for exaggerated and fantastical features, and the features of the shakōki dogū are reconciled contextually. An example of the pregnant woman type of dogū. The Jōmon people are believed to have been hunter-gatherers, though some evidence for small-scale plant cultivation exists. They lived in concentrated groups and utilized food storage and waste disposal techniques. The evidence of Jōmon agriculture is debated, but remains of plants have been found that demonstrate, at a minimum, herbaceous plants and some trees, including chestnut, were cultivated. Other clay figures preceded dogū in the early Jōmon era. Maringer describes the original figures thusly: "The first products were animal-like heads. These exhibit cat- or rabbit-like features, sometimes dog- and serpent-like ones." In the late Jōmon era, the figures became more spiritually developed, but retain the same theriomorphic animal-like expressions. Maringer also notes that "only a few of them [dogū] reach a point of being recognizably human." At least 10,630 dogū were documented by 1991, but the shakōki dogū type is relatively rare. There are a few other types of dogū that were produced in the same era, though the types produced in each time period within the era were slightly different. These include the pregnant woman type, the heart shaped type, and the horned owl type. Each have distinct body characteristics. Regional dogū also differed significantly, with different types of dogū found both geographically and temporally. Most shakōki dogū were found at the Kamegaoka site in the Tōhoku region of Japan, which is located in the northeast of Honshu, the largest Japanese island. It is believed that the dogū had a personal ritual significance, as no evidence has been found of public ritual use. Figurines are often found broken with an arm or a leg commonly missing. Because of the frequency with which they are discovered broken, it is believed that breaking the dogū may have been part of a ritual. Similar figures can be found in the Kofun period, which spanned from 250 AD to 538 AD. These figures are called haniwa, and they are associated with burial. However, they came much later than the dogū, and their purpose is not the same. While haniwa are found at burial sites, dogū are mainly recovered from refuse pits where they have been discarded. The prominent eyes of the shakōki dogū have drawn many comparisons to modern astronauts. One proponent of this idea is ancient alien believer, Erich von Däniken. Von Däniken has written that the shakōki dogū "...has modern fastenings and eye apertures on its helmet." Von Däniken's comment comes at the end of Chariots of the Gods? in which he presents a long series of artifacts that he implies are out of place, otherworldly in nature, or inexplicable in some way in the same anaphoric format: "It is not our fault that..."
Another pseudoarchaeological idea is that the shakōki dogū are representations of alien visitors. One such proponent, Catrien Ross, believes that an alien visitation spawned a religious ritual in which the shakōki dogū were a part: "Is this fantastic clay doll simply the product of an artist's rich imagination? Or was it created to capture the memory of an alien connection that was celebrated thereafter in careful ritual?" Dogū are presented in the video game Dokioki as actual aliens, an interesting inclusion. This serves to work the idea of ancient aliens into public consciousness through inundation in all media forms. Von Däniken's response to the shakōki dogū demonstrates a key theme in much of his work: the principle of the inkblot test. In an inkblot, the viewer describes what they see in a pseudo-random pattern. Von Däniken is a major proponent of the belief in ancient aliens and their intervention in human history, so he is predisposed to see a space traveler in artifacts that have strong and well-understood contextual background. The shakōki dogū are not the only artifact that has been subjected to a similar treatment by von Däniken, but it provides an excellent illustration of the habit in the pseudoarchaeological community to take one type of artifact out of a series of similar artifacts, decontextualize said artifact, and use it to support the notion that early humans were visited by aliens or that early humans were capable of space travel. Additionally, most of von Däniken's argument stems from the head of the figurines bearing resemblance to a space helmet. However, it has been shown that the head is not the most important characteristic in human representation. In fact, the torso is the most important feature in representing a human, not the face. Early dogū do not have any facial features, but detailed torsos. As the Jōmon era progressed, arms, legs, and facial features were added to the figures. Therefore, because the head does not bear as much significance in the dogū, so artistic liberty could be taken with facial features. With regards to the rest of the form of the shakōki dogū, the large inflated arms and legs with small to absent arms may be interpreted as reminiscent of a bulky space suit. However, shakōki dogū are late-period dogū. The earliest dogū did not have arms, legs, or heads, and arms and legs slowly developed over time. Even with the development of arms, the hands and distinction between upper and lower arm is still not well-defined. It was likely not seen as important in representing a human and made carrying a dogū in daily use easier. It is believed hat early dogū were carried, perhaps to remember ancestors or potential deities. The large eyes are interpreted in a modern sense as snow goggles, a stretched membrane applied to a frame. However, in the geographic region in which shakōki dogū are found, such goggles would probably not be needed. Instead, they might be interpreted simply as exaggerated eyes, with eyes being connected directly to the soul. Von Däniken's argument structure plays into the pseudoarchaeological fancy that the believers in these nonscientific claims are the only holders of true knowledge, and that they are fighting against the supposedly conniving mainstream archaeologists. He appeals to the desire to crusade for what he perceives as truth, but at the same time, he ignores the context of every artifact he deems inexplicable. Also mentioned in this passage are the Piri Reis map, the Palenque relief, the "absurdities" of old books, and the number of planets in the galaxy. The artifacts in this passage have very well-understood origins that are ignored by Däniken, and the old books he refers to have context that is ignored, not to mention the absurdities of current text. The intentional omission of the context of any of these artifacts is what characterizes the pseudoarchaeological beliefs. Were context or background to be examined, the artifacts would no longer seem mystical or mysterious. In regards Ross's argument structure, the way in which the suggestion of ancient aliens is presented is quite familiar. As von Däniken said, "in Chariots of the Gods, I had 238 question marks." This tactic is popular in the pseudoarchaeological community because it removes blame from the speaker. When von Däniken was criticized for his statements in Chariots of the Gods, he responded by stating that he was merely making suggestions instead of arguments. The idea that the Jōmon peoples must have been visited by aliens to produce the art that they did is directly racist and ethnocentric. The argument presented by Ross and others is that the figurines were much too advanced for the society in which they were found; that is, one of hunter-gatherers living in settlements. This is damaging for a few reasons. First, it portrays the Jōmon people as incapable and simple, despite evidence that agriculture was beginning to take shape. That the people also produced art is apparently infeasible to Ross. Second, it ignores the rich background for the shakōki dogū; that is, other dogū produced in the earlier periods of the Jōmon era. This decontextualization is dangerous because it only offers a limited perspective. These harmful ideas call back to another of von Däniken's favored themes: that our ancestors were incapable of creating the artifacts associated with them. The vast monuments or intricate art pieces must be the work of an extraterrestrial, because our human ancestors were too intellectually limited to produce them. Of course, when the previous dogū are examined and context is understood, the shakōki dogū become much less fantastical, but they are then also properly attributed to their creating culture. ↑ Kaner, S. & Bailey D. (2009) The power of dogu: Ceramic figures, from ancient japan, 2009. British Museum Press. ↑ Insoll, T. (2012). The new hakodate jomon culture center, minamikayabe, japan. Material Religion, 8(2), 262-264. ↑ 4.0 4.1 4.2 Sumioka, H., Koda, K., Nishio, S., Minato, T., & Ishiguro, H. (2013). Revisiting ancient design of human form for communication avatar: Design considerations from chronological development of Dogū. Presented at The 22nd IEEE International Symposium on Robot and Human Interactive Communication, Gyeongju, South Korea, 26-29 August 2013. IEEE. ↑ 5.0 5.1 5.2 5.3 Pearson, R. (2004). New Perspectives on Jomon Society, Presented at the International Jomon Culture Conference, 2004. ↑ 6.0 6.1 6.2 6.3 6.4 6.5 Hudson, M.J. & Aoyama, M. (2007). 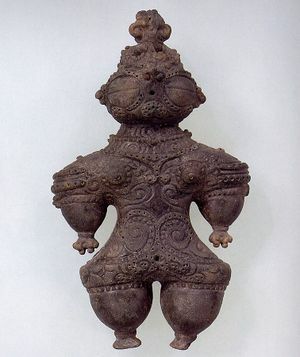 Waist-to-hip ratios of Jomon figurines. Antiquity, 81(314), 961-971. ↑ Naumann, N. (2000). Japanese Prehistory: The Material and Spiritual Culture of the Jōmon Period, 2000. Harrassowitz Verlag. ↑ 8.0 8.1 Kobayashi, T., & Kaner, S. (2004). Jomon reflections: Forager life and culture in the prehistoric Japanese archipelago. Oxbow Books Ltd.
↑ 9.0 9.1 9.2 9.3 Kidder, J. (1957). The Jomon Pottery of Japan. Artibus Asiae. Supplementum, 17. ↑ 11.0 11.1 Habu, J. (2004). Ancient Jomon of Japan, 2004. Cambridge: Cambridge University Press. ↑ 12.0 12.1 Matsui, A. & Kanehara, M. (2006). The Question of Prehistoric Plant Husbandry during the Jomon Period in Japan. World Archaeology, 38(2). 259-273. ↑ 13.0 13.1 13.2 13.3 Maringer, J. (1974). Clay Figurines of the Jōmon Period: A Contribution to the History of Ancient Religion in Japan. History of Religions, 14(2). 128-139. ↑ James, N. & Chippindale, J. (2010). Figurine enigmas: who's to know? Antiquity, 84(326), 1172-1176. ↑ Miki, F. (1960). Haniwa: the clay sculpture of protohistoric Japan. CE Tuttle Co..
↑ 16.0 16.1 16.2 von Däniken, E. (1968). Chariots of the Gods? 1968. Bantam Books. ↑ 17.0 17.1 Ross, C. (1996). Supernatural and Mysterious Japan: Spirits, Hauntings and Paranormal Phenomena, 1996. Yenbooks. ↑ Eggert, Kaylan. "The Von Däniken Legacy." Ancient Aliens, season 5, episode 10, The History Channel, 5 Apr. 2013. This page was last edited on 1 December 2017, at 15:49.